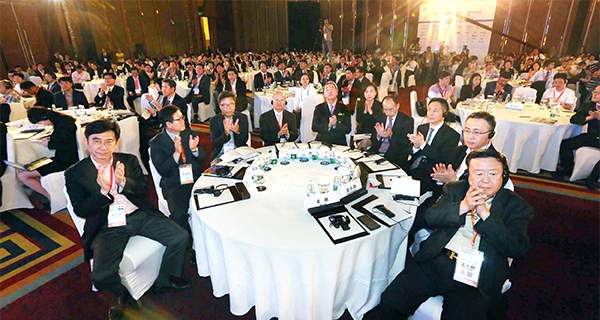 The Maekyung Global Forum in Shenzhen, China, running from May 21 to 22 will bring together public-sector and business leaders from Korea and China to tap common opportunities and benefits in the state campaign to connect nine cities of Guandong Province, Hong Kong and Macao dubbed Guangdong-Hong Kong-Macao Greater Bay Area. Under the leadership of Chinese President Xi Jinping, the country aims to set up a cluster in the region being groomed as the next Silicon Valley by 2035 to promote IT, bio, 5G, eco-friendly car, renewable energy and financial industries. The project kicked off in October 2018 upon opening of the world’s longest sea bridge Hong Kong-Zhuhai-Macau Bridge. South Korea’s trade minister Sung Yun-mo will attend the forum to seek follow-up measures after Korea-Guangdong Development Forum held in Seoul early this month. Former leader of the ruling Democratic Party Choo Mi-ae and head of the National Policy Committee of the National Assembly Min Byung-doo will also join the event to explore ways to deepen the bilateral relationship. From the business sector, CJ Group Chairman Sohn Kyung-shik, Samsung Electronics Vice Chairman Yoon Boo-keun, LS Mtron Chairman Koo Ja-eun, Jusung Engineering Chairman Hwang Chul-joo and iA Chairman Kim Dong-jin will be flying to Shenzhen, a major city in Guangdong, to participate in the forum. Lotte Chemical CEO Lim Byung-yun, Posco Capital CEO Shim Dong-wook and LS Industrial Systems’ Digital Transformation leader Lee Hak-sung will also attend the event. Right after the forum on May 23, financial figures and entrepreneurs of Korea and Hong Kong will be invited to a round table conference in Hong Kong to discuss ways to strengthen cooperation for Greater Bay Area project. Guangdong is the richest and most populous province in China, boasting the country’s biggest economy and export volume. The southern province, one of the first beneficiaries of China’s opening policy, is now home to some of China’s most valuable tech firms including the country’s biggest electric car maker BYD, the world’s largest consumer drone manufacturer DJI and the social media and gaming giant Tencent. Guangdong is also Korea`s largest trading partner in China. Its trade volume with Korea last year amounted to $74.9 billion, accounting for 28 percent of the total trade between the two countries. As many as 1,400 Korean companies are currently doing business in the province.